Hello! I'm Rachael, a twenty something beauty and lifestyle blogger. I'm originally from Yorkshire but am currently based in Manchester & live with my lovely wife and cat. Bit of an odd one really! One of my absolute favourite quotes is ‘Yield not to calamity, but face her boldly’ by the poet Virgil, as it reminds me to be courageous and brave in what is often a hectic life, so that's where the ‘calamity’ part comes from. 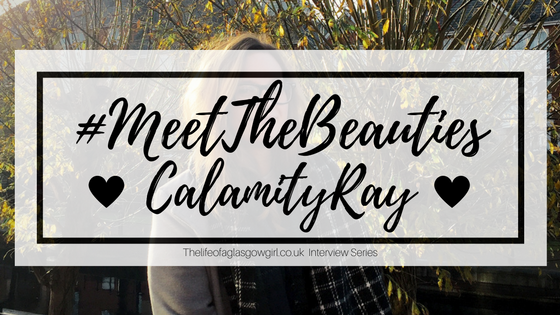 Ray is one of many nicknames, so from putting the two together Calamity Ray was born! I dipped my toe into the blogging pool a few years ago but never really dedicated enough time to it. In August 2016 I decided it was something that I wanted to do - and stick with - and I began posting once a week in September 2016. In person I'm super shy and not very confident, which makes it difficult for me to participate in most face to face daily conversations, even with people I know really well. Online I feel like I have a stronger presence and an audience that I can discuss anything with, be it a beauty review or mental health tips and it's such a freeing feeling. A few of my favourite more well known bloggers/vloggers include Lily Pebbles, Helen Anderson & Jess (sunbeamjess). Organisation is absolutely key! Carry a notebook everywhere and write down every thought and idea you have, no matter how insignificant it might seem. Spend time planning your content - I have physical and online post planners that I'm constantly updating - they're my own personal blogging bibles. I'm a tech obsessed geek with a college background in computers and design. I love taking things apart and improving them, and built my first computer aged 17! I tend to write about things I love and am passionate about, so I suppose I'm always inspired! If I'm feeling like I need a few ideas I'll look at instagram & blogs I like and go from there. I was a fan of beach holidays when younger, but after visiting Berlin in winter last year I completely fell in love with the cold and cosy city. I'd love to go to America - NYC and Disneyland are definite dream destinations! 9: Out of everything you have blogged about so far, do you have a favorite post? At the moment a recent post covering a LUSH beauty blogger event! I had an amazing time, met some lovely new friends and it was so fun to write up and take photographs for. Special Thanks to Rachel, CalamityRay.